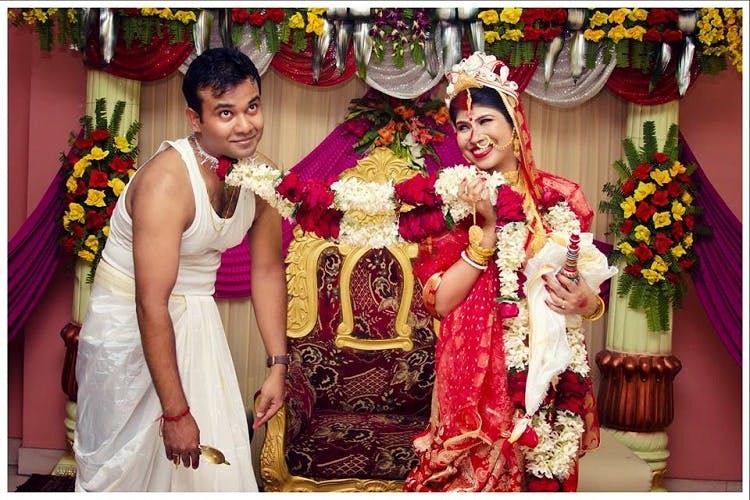 These Kolkata photographers will capture the perfect moments from your wedding in pixels so you have memories to last a lifetime. This photographer and videographer will not only capture your wedding from unique angles and perspectives (all the while making everyone look absolutely fabulous) but her photos make everything come alive. From the sangeet and haldi ceremonies to the end of the wedding, get a carefully edited video complete with behind-the-scenes footage and background music. No stilted pose or jaw aching smile anymore because this photographer's friendly demeanor will put you at ease instantly. Kundan De is known for lively pictures and perfect finesse in capturing fleeting, priceless moments. He is your best bet to make every brief moment of your wedding memorable. Traditional yet creative, her images speak for themselves. Capturing the special moments at exactly the right time and a keen eye for detail, she is known for bringing fresh ideas to the table and for delivering fast and professional work. She’s also up to travelling so you can hit her up for outstation gigs as well. Get all the shots of the bride looking as radiant and glowing as ever – these guys can capture and light up bridal beauty. They even do a pre and post wedding shoot if you want to get more than one day on film. You have to book well in advance to get an opening (they’re pretty popular in the city). They take breathtaking close-ups and have an eye for converting simple moments into lively (even humorous) shots. Their wedding albums are full of candid PDA and fleeting moments between the couples. Go for the wedding package to make it more economical. They have already opened bookings for 2018 – grab your date now!